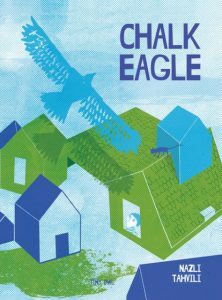 If you’re a fan of picture books, then you’ll be pleased to know that our book trailer for Chalk Eagle has been released. The uplifting music and swooping animated eagle helps the stunning screen printed illustrations to come alive. A young boy, living in the heart of a busy city, wishes he could fly away from all the bustle and find adventure by the mountains and rivers. When he spots an eagle flying above him, he decides to draw his own eagle, and himself, in chalk. They fly away together and embark on wonderful adventures of the boy’s own imagination, showing that the power of imagination can bring to life every child’s dream of soaring into the sky. Chalk Eagle will be published on the 29th of January and is available to pre-order now. As a wordless picture book, it can swoop across language borders and be enjoyed by any age, regardless of reading-ability. Nazli Tahvili’s stunning illustrations are simple and bold, allowing the reader to take the lead and tell the story for themselves.